UM Lohia Two Wheelers has showcased the UM Renegade Sports S Vegas Edition at the 2018 Auto Expo in Greater Noida. Here are the cruiser’s live images from the show. The UM Renegade Sports Vegas Edition is based on the Renegade Sports S, but gets a few aesthetic additions. 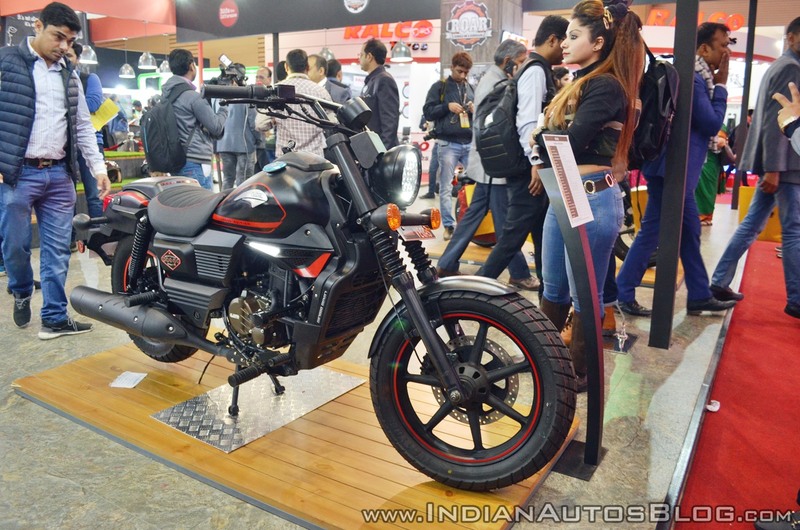 For starters, the motorcycle features drag-style handlebars, TVS knobby tyres, and an LED headlamp. The bike also sports matte black paintjob with exclusive Vegas-themed graphics. The ribbed seat comes with a pillion cowl for added sportiness. 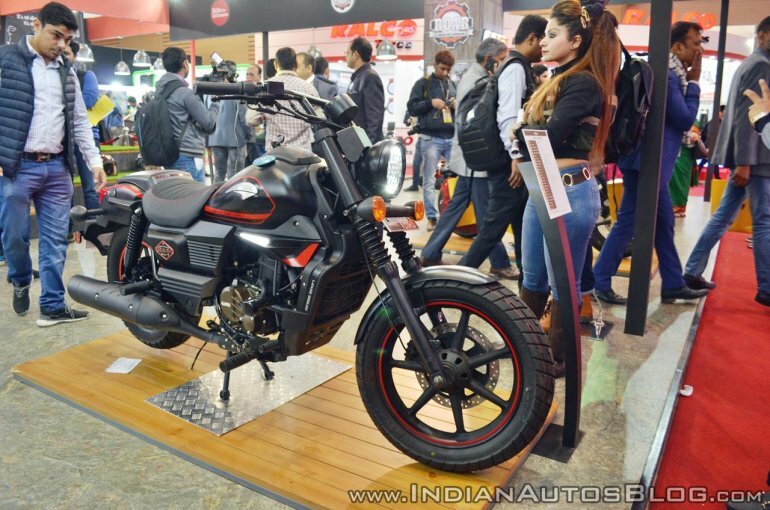 Expect the brand to announce its plans of launching the bike in the coming months. If launched, it would be placed as a premium variant of the Sports S.
The mechanicals are the same as the standard bike. It continues with the 279.5 cc single cylinder mill with liquid cooling and fuel injection. The engine puts out 25.15 PS at 8,500 rpm, and 23 Nm of torque at 7,000 rpm. The powerplant works in conjunction with a 6-speed gearbox. 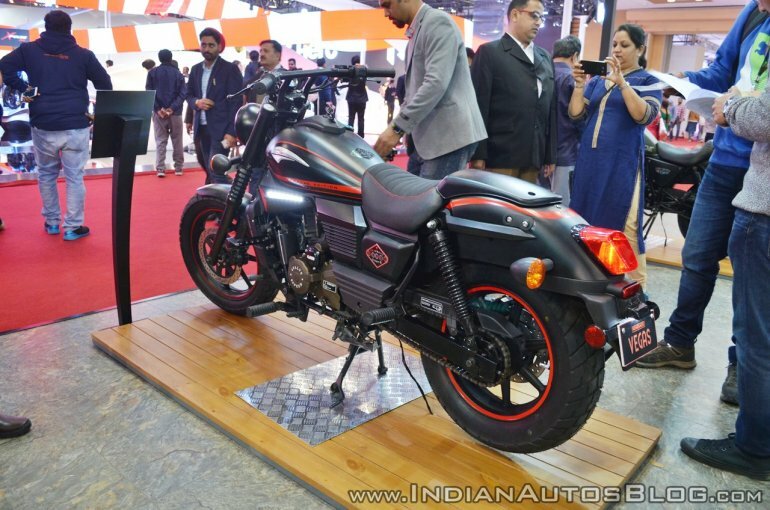 The UM Renegade Sports S Vegas Edition rides on 41 mm telescopic front forks, and twin rear shock absorbers. Brakes include discs on both ends instead of the disc-drum combination that the normal variant comes with. While the already-launched Vegas Edition has practicality and ruggedness, the Vegas Edition offers extra oomph.